Here, six bacony sandwiches that would be even better with a weave of meat. In this week’s episode of Mad Genius Tips, F&W Test Kitchen sandwich maestro Justin Chapple demonstrates how to make a bacon weave for the baconiest BLT ever. But that’s not the only sandwich the crispy, meaty square can improve. Here, six bacony sandwiches that would be even better with a weave of meat. This version of the classic breakfast sandwich—topped with bacon, a fried egg and cheddar cheese—is quick and easy to make. Fast and filling, these easy, meaty sandwiches are covered with chipotle-mayonnaise. 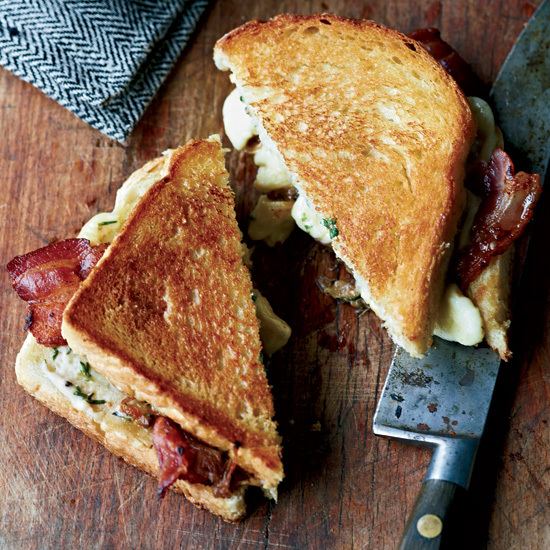 Cheese curds are milky and delicious in a grilled cheese sandwich like this one. Flaky salmon, tart Granny Smith apple and crispy bacon are an incredible combo. This sandwich is one of the best ways to eat crunchy, fried soft-shell crab. It's hard to go wrong with this super-satisfying sandwich.